On the other end of the cocktail complexity spectrum (right down the other end of the bat in fact) are the mixological masterpiece manoeuvres of Club Med Kani (above). I raise my glass to your glass dropping! Coconut Full Moon tonight. The perfect time to toast that essence of equatorial elixir – pina colada. Maldives is not my only tropical love. I am also an epicurean devotee of the pina colada. It is my tropical cocktail. I only really drink it in the Maldives because I do believe that ambience and context is as much a part of an exceptional drink experience as the drink itself. 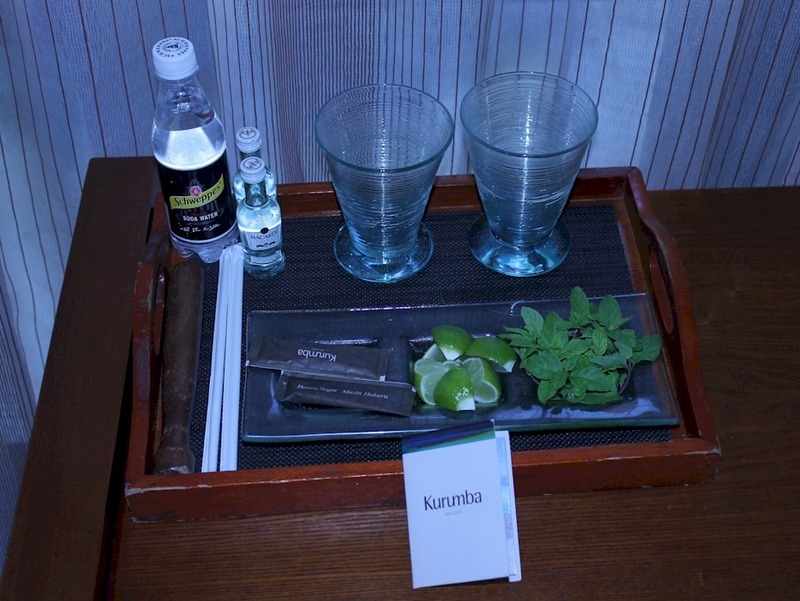 Like port with cigars and cards. Or Pimms at one of The Season events. I have occasional sampled pina coladas when I am at establishments renowned for their mixology just to explore their spin on this classic. But the experience is more clinical and investigative than my sensual savouring in the Maldives. My pina passion has reached a higher profile as a part of my annual Maldives Tour posts to the Trip Advisor Maldives Forum. I post a daily thumbnail sketch of each resort highlighting things like the weather, my favourite dish, snorkel spottings. And I include a headline assessment of the resort’s pina colada. 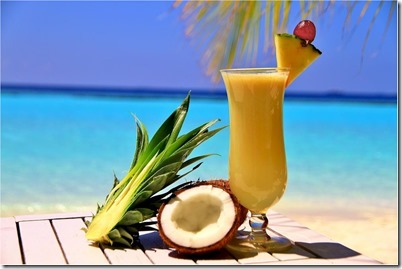 For me the pina colada is as iconic a tropical drink as the Maldives is a tropical destination. And it can be an emblematic indicator for the resort overall. 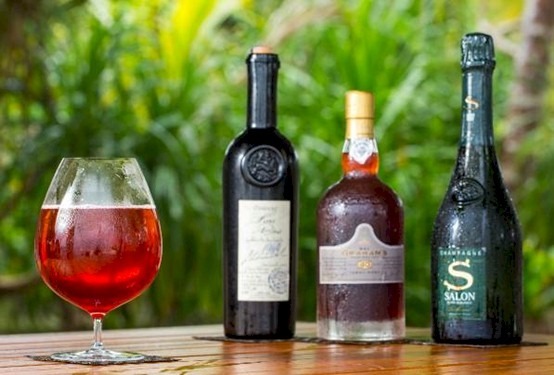 It’s complicated and varied enough that the resort’s own quality of ingredients, attention to detail, creativity, flair and even personality can shine though in this little alcoholic microcosm. You can have foamy vs. flat, shaken vs. blended, iced vs. chilled, not to mention a range of ingredient variations (eg. coconut cream, coconut milk, coconut flavouring). And it can be presented in simple tall glasses with a sprig or garnish to coconut shells with a cornucopia of fruit and frills. Last year, the epicenter of all things coconut, Kurumba resort, rose to the “Pina Colada Challenge” with an unprecedented flurry of pina colada artistry on the occasion of my visit. The exceptional evening got me questioning my first principles. With all of the options and variations, what was I looking for in the “perfect pina colada”. That led to a bit more “research” and now my own recipe and guidance for the quintessential pinoconut concoction. 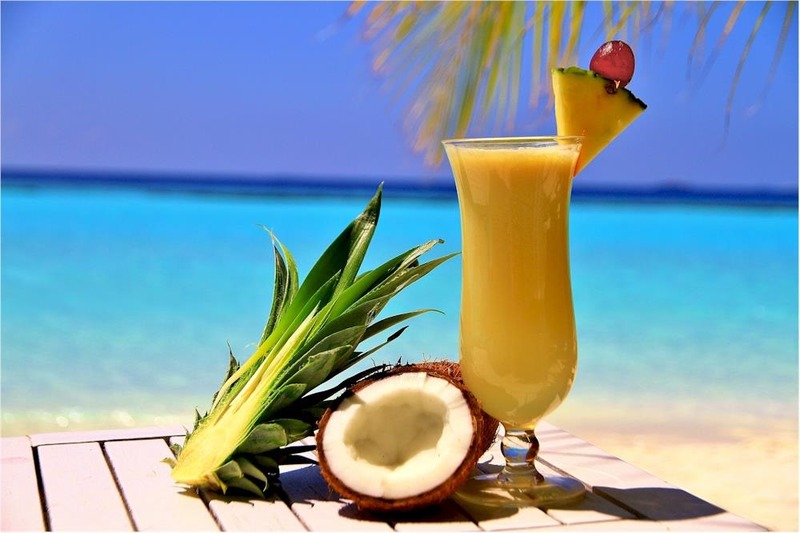 FUNDAMENTALS – What are my basic principles for the ultimate pina colada? Store all of the ingredients in the freezer. Including the rum and the glass along with frozen coconut cream and pineapple juice. Note that you will need to freeze the coconut cream and pinapple juice in small chunks or cubes in order for them to blend effectively on mixing. Serve in a “stem” glass so the hand does not warm the drink while holding it. Things – Fresh. Fresh, top shelf ingredients should be a given, but I am always surprised at how many top resorts try to get by with inferior ingredients. Fresh pineapple juice. Not from a can or concentrate (which almost always has added sugar). Top quality white rum. Not the cheap stuff. Not dark rum. Texture – Fine. Another bad bit are…the bits. Yes, it is a “style” thing. Much like the difference between the more finely textured Parisian bisque as opposed to the more rustic and thicker Normady bisque. The pulp might seem to add to the appearance of freshness, but the mouth feel distracts from the focus on the flavours and the frozenness. Despite many classic recipes call for it, I first tried to avoid the Sugar Syrup ingredient. I thought one could get the desired sweetness with the pineapple juice and even the coconut cream would contribute a bit. However, in depth experimentation showed that the syrup really helped to smooth out and mellow the final product in a way no other balancing could (without sacrificing the rum kick). 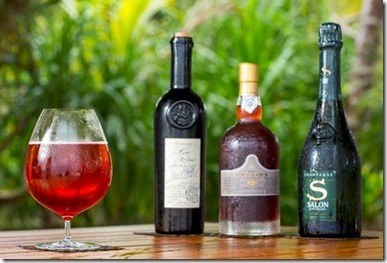 If getting or making the sugar syrup is just a step too far, then actually using Malibu Rum (the exception to the “not flavoured Rum” rule) provides the same sweetness and some of the mellowing effect (but unfortunately does introduce a distinctly “artificial” or even “chemically” tinge). Also notice NO ICE. Ice just waters down the drink and interferes with the smooth sipping. The frozen ingredients provide all the frigidity that you need (and more than shaking over ice will ever do). Perhaps the key objective here is balance. You don’t want any individual ingredient overpowering the flavour. You want all of the tastes to blend harmoniously. Baccardi Carta Blanca Superior White Rum – The classic and default option. Brugal Especial Extra Dry Rum – The premium option for smoothness and distinction (“clean, dry rum which contains fewer of the heavy alcohols which tend to provide other rums a sweeter flavour profile. The Especial Extra Dry is blended from a mix of rum spirits which have been aged a minimum of 2 years and up to as many as 5 years in White American Oak casks. The rum is triple charcoal filtered, and was developed as a high-end cocktail spirit”). Malibu Caribbean Rum with Coconut Flavour – The oft-resorted to shortcut for coconut and sweetness boost. Blend ingredients until smooth. Not too little so that it is lumpy. Not too much that it overly thaws the drink. Depending on the type of blender you have, you might want to pre-crush the frozen coconut cream as this can freeze quite solidly. You can let your inner Carmen Miranda go crazy if you like, but there is only one classic garnish – a skewered Maraschino cherry and pineapple slice perched on the edge of the glass. Some say the cherry is dated and even twee, but I guess I am just too old school. And no straw! The drink needs to be sipped from the glass like a fine wine. Straws are mostly for drinks with ice (see note above on “no ice”). The Guardian has also published their pina perfection path “How to make the perfect piña colada”. It’s an okay recipe. I’m against the use of ice for a truly “perfect” pina, but I understand how it is an expedient way to achieve coldness. And the piece provides some in depth perspectives on some of the dynamics of the drink. Happy Hour Coconut Moon everyone! Researching yesterday’s croquet piece, I was struck by the curious terminology of the game much of which seemed like a menu for exotic cocktails – Super Shot, Dambuster, Dolly Rush, Mangler, Octuple Peel, Straight Triple. It brought me back to our Sun Siyam Irufushi visit and wiling away too many hours at their “Water’s Edge” bar. Over 90% of cocktails there are custom recipes made by Anil. As our waiter commented, “No one wants to drink Coca Cola at the Maldives”. 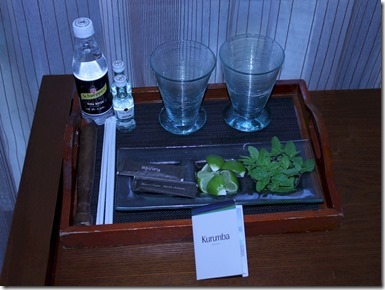 While I tend to stick to my ritual pina coladas during my resort visits I nonetheless always appreciate inventiveness. And Lori always seems to be interested in trying an unconventional concoction. I’ll often sample hers and more often than not the cocktails are more oddball than highball. Sun Siyam Delight (Signature cocktail) – Vodka, Triple sec, Mango Liqueur, Fresh Passion Fruit plums, Fresh Mint Leaves, Mojito Mint Syrup and Soda Water. Shake with all the ingredients and pour into glass and add mint leaves. top up with soda water and stir well. it is very interesting refreshing cocktail. All Rounder (competition winning cocktails) – Vodka, Peach Liqueur, Triple Sec, Fresh strawberry, Fresh Orange Juice and Grapefruit Juice. Muddle the strawberry and add all the ingredient and shake well. it is well balance, sweet and slightly better taste and refreshing. Login (competition winning cocktail) – Vodka, Midori, Fresh Pineapple Juice, Fresh Lemon Juice, Mojito Mint and Fresh Basil Leaves. Shake all the ingredients with fresh basil leaves and strain into the glass. Serve on the rock and it is wonderful refreshing sweet herb cocktail. The Goal of 1934 (USD$2,090) – Inspired by the 1934 World Cup in Italy, where Czechoslovakia lost 2-1 to the host nation in the final. This cocktail is created with Guy Lheraud “Carafe Eve” 1934 and Bollinger “RD” Extra Brut, 1996. A Good Year Cocktail (USD$1,930) – 1930, known as the year of peace and tranquillity, heard BBC Radio from London on 18th April reporting that “There is no news” and a good year for all, uses vintage Armagnac – Guy Lheraud, Vieil Armagnac 1930 and topped with Louis Roderer Cristal. Lucky & Al (USD$6,530) – Homage to the Prohibition era in the US, this cocktail is created with a vintage 1930’s Guy Lheraud, Vieil Armagnac and Salon 1988 Champagne. The Belle Époque (USD$4,285) – A time of peace and prosperity, this era is considered the start of the ‘golden age’ post World War I and is made with a rare Guy Lheraud, Vieil-Armagnac, “Baron Gaston Legrand” 1888 and Dom Perignon Cuvee Rose 1982. Eiffel Tower (USD$2,470) – For 1990, when the Paris World Exhibition celebrated the Eiffel Tower, this cocktail is created with Guy Lheraud, Vieil-Armagnac “Baron Gaston Legrand” 1900 and Dom Perignon Onotheque 1996. Fly me to the Moon (USD$1,230) – Based on the moment when Neil Armstrong and Buzz Aldrin landed on the moon, uses Vintage Port- Graham’s 1969 or Cognac Guy Lheraud “Fins Bois” 1969 and is topped with Salon 1999 champagne. So you can toast today’s 127 anniversaire of the Tour Effel’s opening with a double distillation of “drinking stars”.